This is possibly the most upbeat song about the financial crisis you could imagine. Less "Brother, can you spare a dime?" than "Brother, I may be poor but I am rich in experience and isn't that what really counts?" You may remember Passion Pit from the ridiculously catchy The Reeling, which was practically inescapable on trailers and sports montages about three years ago. They have a knack for bright, inspiring melodies but their previous lyrics were all a bit twee: Happy families and smiling faces. One of their early songs was even called Cuddle Fuddle. The new single, Take A Walk, is a big leap forward. 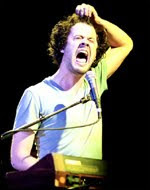 Frontman Michael Angelakos clearly knows it, because he's posted the lyrics in full on the Passion Pit website. Across three verses, they tell a very personal tale of immigration, debt, missing pension funds and swindling bankers - all set to a stomping marching beat and ticklish keyboard riff that sweetens the pill. It's an interesting take on the crisis - less angry than Plan B's Ill Manors, but less easily dismissed as a result. Take a listen below.